Bring your BBQ to life with this deliciously fragrant side. Remember to put a damp tea towel under your chopping board to stop it from slipping. 2. Melt the butter in the small saucepan and set aside. 4. Add the corn and simmer for 5 minutes or until cooked through. 5. Drain in the colander and set aside to steam for 5 minutes. 6. Preheat a BBQ or griddle pan to high. 7. Place the corn into the large bowl and drizzle over the melted butter, paprika, sea salt and pepper. Toss to coat evenly. 8. 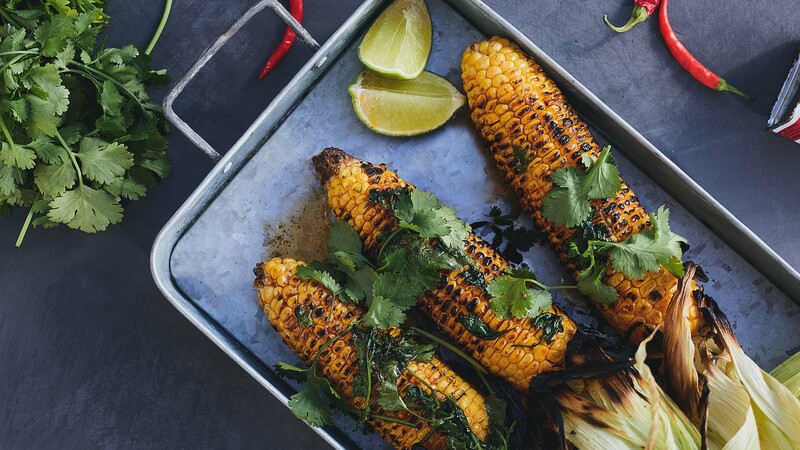 Place the corn on the BBQ or griddle pan and turn regularly until the cobs are slightly charred on all sides. 9. Remove from the heat, allow to cool slightly, then chop each cob into 5 small pieces. 10. Transfer to the serving platter and serve with the coriander sprinkled over the top and lime wedges on the side.